Here's where I'm up to now. You can see there are lots of bits sitting there that are just being tried out. Some I like, others, (like the shirt collars) I will probably jettison next time this comes out of the box. The pocket, I think, will stay. My thoughts as I look at this are that a) I need to keep sliding the two plains here into the mix, just to create tiny peaceful moments amongst all that print and b) I need another something - could be just squares, could be a flying goose on a bigger scale, maybe even a square with a circle. 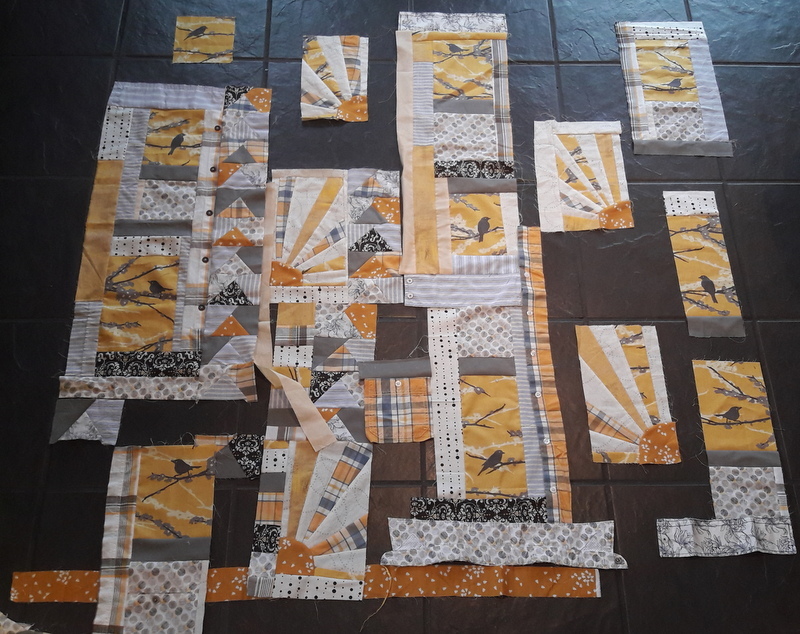 My favoured option would be a bigger goose, just because the circles in my mind's eye would require me to get all neat and careful for a bit and I'm just not in that place, but we'll see...And while I ponder, I can just keep on making the geese I'm already using - I'm going to need a fair few. A reminder, too, that next Tuesday it's time for the January AHIQ link up. Even if you haven't got anything to share, do come and check it out, as Ann will be posting details of the first AHIQ Quarterly Challenge. I love all these blocks and elements! I'll look forward to seeing your progress with it! Have you tried it so that all the sun's rays point out instead of in? But still "up" the way you have them. It could reduce the tension, and then the solids (and the circles) would seem less necessary. What if you took the two columns on the right and put them on the left, with the suns inside and the birds outside? It might trigger some new ideas. In any case, I'm loving it! Perhaps some of the larger areas need the plain fabrics with some of your tiny words? So lovely. Maybe decide on the finished size, approx. and then divide into three main design areas, keeping in mind the 'rule of thirds.' Artists use this basic idea in their work. A 'method' might make things less agonizing. I like the peeks of slate flooring between the blocks . How about little bridges of grey ? Yes, I think seeing what you are "playing with" that the geese would be better a little bigger. Better proportion. Fascinating how repeating fabrics and blocks, within a unifying color palette pulls together so well. There is so much going on, you would think it would feel busier. The color scheme is just right - yellow and gray. The birds are the focus, in my opinion. I am sure that when you decide the final layout, it will be perfect. There is nothing automatic or instant about creating art. It takes so many iterations and do-overs to create a piece of beauty. For now, I am thankful that you are sharing the process. New Year, new quilt and about time too!